You're invited to a live webinar! If you're at all familiar with the fee-only model, then you're probably also familiar with this age-old question: How does investment management fit into fee-for-service financial planning? 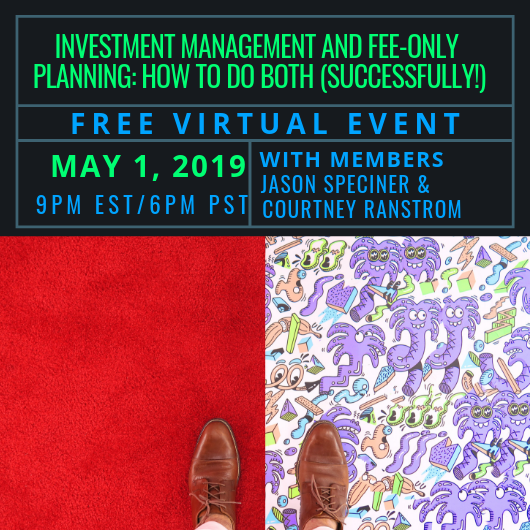 In this free webinar, XYPN members Jason Speciner and Courtney Ranstrom answer this question and share how they successfully incorporated investment management into their fee-only firms. This call is ideal for anyone considering joining our Network of like-minded advisors. Courtney Ranstrom, CFP®, MBA, co-founded Trailhead Planners with her brother, Morgan. One of the questions she asks herself and her clients is “What does wealth mean to you?” In many cases, wealth has nothing to do with money but with how we find fulfillment in our lives. Courtney does not believe in imposing arbitrary standards of wealth onto her clients. Rather, she wants her clients to understand what wealth means to them and how they can achieve their version of wealth. Her conversations with her clients are not just about money, they are about building a financial life plan tailored to each client’s values, resources, and ongoing life goals. Jason Speciner, CFP®, EA, created Financial Planning Fort Collins to help clients plan for the financial challenges of a new reality—challenges that require a different and more efficient approach than what worked decades ago. Upholding the fiduciary standard, Jason provides valuable fee-only financial planning, investment management, and income tax services to help his clients move their finances forward. Jason specializes in serving those who are relocating and/or going through a career change, as well as employees of public service institutions throughout Colorado.